The Cosmic Egg - ARTE AMAZONIA provides a global voice through art for the indigenous cultures of the Amazon. 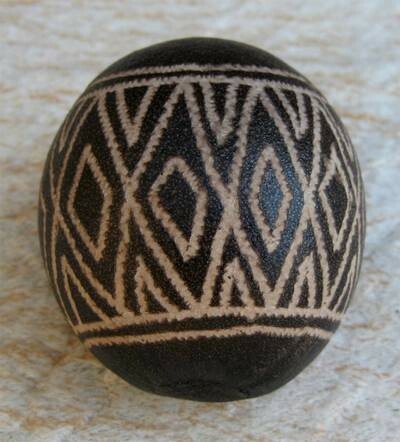 These unique egg shakers are hand crafted in Peru and made by the Bora. Implementing their traditional techniques, they are made from local calabash, called Totumo. This fruit is harvested, dried and then etched with power animals and geometric designs. Calabash is very hard and is traditionally used for shaman rattles and drinking bowls. 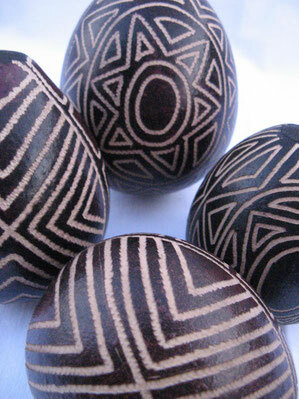 These eggs are filled with Huayruro rainforest seeds which are believed to bring good luck. Our smallest ones are about 1.5 x 1.5 inches but don't be fooled, theses little eggs are powerful. The larger ones, which are approximately 6 x 4, make a stunning home accent, not to mention, they feel and sound great! Handmade in Peru and available in five sizes mini, small, medium, large and grande and each resonating it's own energy with it's own design. They are made of dried and then carved calabash with rainforest seeds inside. Throughout many ancient traditions you will find the egg and the serpent are symbols of transformation, rebirth, resurrection, and the divine feminine.